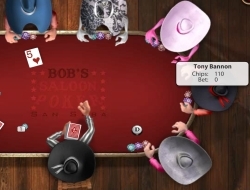 This is a fun poker game in which you will have to earn your money and respect in a cool western world filled with other fresh starters, or veteran players. Create your very own cowboy and start hitting those casinos in all the villages. Once you acquire enough money you will eventually be able to buy your own house, and maybe even create your own city, all with money earned from poker. Be sure to check out the poker rules and even a few tactics, like playing it safe or trying to bluff other players into thinking that you have a great hand, when in fact you have a weaker one. Governor of Poker 0.00 between 0 and 10 based on 0 votes.